Re: Could this be the next "Must Have" FM DX receiver? I just checked a Skoda Swing (RCD-310) car radio inside. It includes two NXP TEF6730HW and one SAF7741HV. As I know, the Sony XDR-F1HD also uses NXP TEF6730/SAF7730 chipset. Wow! At last. A good reason to buy a Skoda! As I know, in the car RCD-310 uses amplified antennas. So, at the antenna connectors there are 12V DC. Can it make a short circuit if I connect a "simple" dipol or any "ordinary" antenna to the unit ? I couldn't resist and I had to do it. I bought another car stereo! Yes, I know, I am boring! This time I give it a chance to Kenwood KDC-710DAB. It's a brand new unit from Halfords. Cost me £140. Just hooked it up today. I will not be having to much time to test it today, but I will do some initial tests over the weekend. What I can say now, it'seems to be very sensitive and it sounds like it has NXP DSP controller. The manual says usable sensitivity is 6.2dBf. There is nothing about selectivity, but I will test it. I went through that phase of buying loads of car radios. I grew out of it. I culled many if them. I still have a box full. Any takers? I can't stop buying portable radios though. I also have quite a collection of SDRs and hifi tuners. I have been testing Kenwood KDC-BT710DAB yesterday evening and today morning. The main focus was sensitivity and selectivity. But first, a few things about external appearance. This relatively new Kenwood car stereo (2017 model, surprisingly Made in Indonesia) feels cheap, in terms of appearance and touch. Compare to Pioneer DEH-4700MP, well there is no comparison...Using Pioneer is more friendly, I'd say??? The tuning buttons on Kenwood's front panel are very tiny and very hard to press. I think because today people use steering wheel buttons instead. The good thing is the screen, very bright and rather large. Pioneer's screen is slightly smaller. 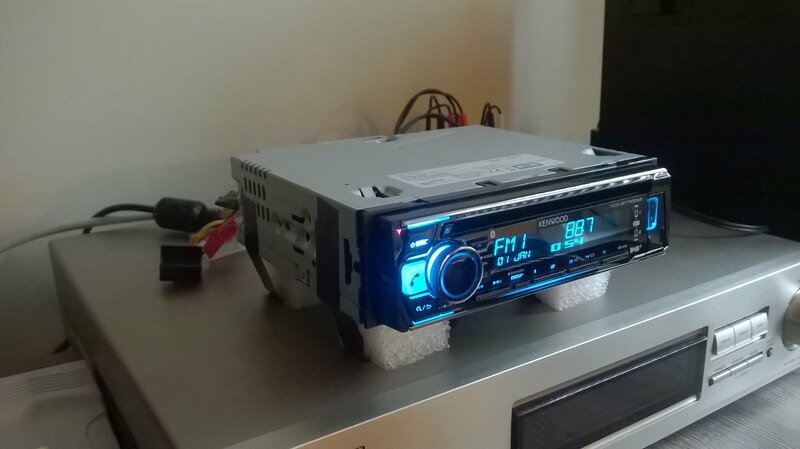 On the back of the radio, Kenwood engineers decided to install a heating radiator, which can be hot after using stereo for a few hours. Ok, it's not a big deal, but I would recommend adding standing feet for better ventilation. I know that previous models (i.e 73DAB) does not have a radiator but a cooling fan, which I think is a better option. Unfortunately, capacitors do not retain settings if a stereo is disconnected from the mains. Every time I unplugged the stereo from the mains, I have to setup it up again. That can be annoying, but setting up the tuner doesn't take too long. The radio software is very responsive. Pioneer, on the other hand, does keep all the settings after disconnecting it from the mains. ISO connector from Pioneer cannot be used on Kenwood. Both brands using Mistumi connectors, and both are slightly different. There is one big disadvantage for me, at least for some time Pre-outs DOES NOT send RDS data. That means, the stereo cannot be connected to RDS Spy. At the moment due to valid warranty, I am unable to open it up and trace for RDS chip. It think this is the only way to get an RDS via RDS Spy. The good thing though is that Kenwood decode RDS very and I am VERY fast. It is literally a fraction of a second when I had RDS displayed. It's amazing how fast this works. That also means, the stereo is very sensitive and that's true. I compared Kenwood to Pioneer. Signals that are buried in the noise were more audible (due to soft mutting) on Kenwood. Also, RDS popped in on weak (noisy) signals faster on Kenwood. Kenwood stereo must have NXP chip. I haven't opened the unit, but I am 100% sure there must be NXP single tuner (TEF series or newer) inside. The would also explain heating issues that occurring with NXP chips. In terms of selectivity, Pioneer and Kenwood were very close. I would say marginally Kenwood was better. I also compared Kenwood sensitivity to Airspy HF+ and it's very close too, but signals on Kenwood sounded slightly louder and less noise was generated. Because having no option to connect the stereo to RDSSPy, I was thinking about returning it, but it's a keeper. The sensitivity of this radio is great, superior to my Pioneer. I honestly have a pleasure listen to the radio on Kenwood. Below is the link including bandscan from today, just to demonstrate the stereo. Even without the RDSSpy option, I think this little stereo will be great for tropo. I would not recommend for Es since tuning buttons are very small the scanning option isn't fast. SDR or "tuning wheel" tuner is a lot better option in this case. I hooked up Kenwood KDC-BT710DAB car stereo again after long time being not in use and I am well surprised of the selectivity of this little radio. I recorded a short video receiving a weak signal of 92.5 BBC R4 (it's either Guildford or Manningtree TX) next to local 92.6 Radio Verulam, with TX located nearly 1 mile from where I live. Also, I opened the radio for tracing an RDS links, but I need a magnifying glass as printing on PCB is very small. I haven't opened the tuner because I would have to unsolder the shielding (BTW the tuner board is very well shielded). No editing was done to the video. I recorded sound directly to the camera via input line. I must admit this little radio is very close to Airspy HF+ that I have. Of course, this is a car stereo and mising many features that are available with modern SDRs but in terms od selectivity, on FM band, is not inferior to AIrspy HF+. Interesting Zach. None of the many car stereos I own/have owned have been able to perform like this. (I have the Pioneer Pioneer DEH-4700MP same as you do). The filter system on your Kenwood behaves in a similar way to SHARX. I only have one rx with SHARX (Blaupunkt Casablanca CD52), and unfortunately this model takes up to 60 seconds for the SHARX system to react, and there are volume issues. I don't remember getting anything 100 kHz away from the Blackpool 400W 96.5 MHz local (txer on Blackpool Tower), when I was in Blackpool. Getting clear reception 200 kHz away from 96.5 was easy on most of my car stereos. I don't have them with me here in Bangkok, as they are in storage in the UK, along with the bulk of my DX gear. I have seen your videos, but I will revisit the again. Kenwood doesn't specify SELECCTIVITY in the manual for KDC-BT710DAB, but I believe it's somewhere in the region of 80dB or perhaps more? Pioneer DEH-4700MP, which I also own, has 80dB (+/- 200Hz) selectivity stated in the manual. I tested both radios and I am fairly confident that Kenwood will outperform Pioneer. The difference is not like night and day, but is clearly noticeable. I believe JVCKenwood Corp. used the same DSP tuners for JVC and Kenwood car stereos. It's likely NXP semiconductors which supply DSP tuners for JVCKenwood, but as I said above, I haven't opened the tuner so at this point it is only speculation. Nevertheless, the radio behave in a similar way to well known Sony XDR series models. Automatic DSP filtering is used for rejecting unwanted signal. I cannot control it. That's a shame. I noticed that on many occasions stations 100kHz are often audible without (or moderate) splatter next to a strong signal, but also extremely weak signals can be heard (still without major splatter) but intelligibility isn't as good as on Pioneer. I have just checked and the Kenwood KDC-BT710DAB is now 110 Pounds at Halfords. It has been discontinued on amazon.co.uk. I have a JVC KD-G342 which has similar selectivity to the Pioneer DEH-4700MP, but unfortunately I had an accident when soldering and it no longer functions fully. This video is from 2010 when it did function fully. It is in Auto IF mode (no longer works, only Wide IF mode works now). Car Stereos made in Thailand eg Pioneer don't seem to have RDS. (They don't have DAB either). There are some low prices though. Difficult to know if a car stereo from Kenwood sold here would have the same FM tuner as your Kenwood. Of course an SDR is much better and more flexible. I found this video from when I first got the Funcube Dongle Pro+ (Nov 2015). Note I use the Zoom FFT filter plugin in SDR# to shape the IF bandwidth. Zach, I didn't notice you using this filter with your Airspy HF+. I rarely use Zoom FFT filter because I don't have too many adjacent channels that generate massive splatter. However, on tropo this is very helpful and I must admit that SDR is a step far from the conventional tuners/radios. I still like to play with radios simply because it's a different feeling. It's like an old-fashion way DX. Nevertheless, here is another video demonstrating sensitivity of the little Kenwood. This little car stereo is Amazing! Whilst RDS was locked straight away on Kenwood, Airspy HF+ was struggle to display PS name. It looks like Kenwood is more sensitive then Airspy.